Another fabulous book has come up free again. “Dine with Us” is a cookbook offering recipes and novel samples from independent authors. I love this unique approach to introducing authors to a hungry public. We all gotta eat. If you love to cook and read, this is the ideal book for you. In the spirit of the book, I have included my recipe for crispy garlic chicken at the end of this post. 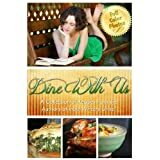 Dine With Us is a collection of recipes from the authors of Indie Writers Unite. It combines our most savory dishes with a sample from one of our novels, allowing you to get to know us while enjoying delicious food in the process. Recipes are shared in the categories of: Appetizers, Breads, Soups, Salads, Sandwiches, Main Dishes and Desserts. Additionally, each recipe has step-by-step instructions along with a full-color photo. Note: I don’t usually measure ingredients, so these are all approximates. Heat the garlic and the oil together, either on the stove top or in the microwave. Heat just enough to season the oil. Pour into a bowl large enough to hold the chicken. Let it cool so it doesn’t cook the chicken. Place the chicken in the bowl and mix with the garlic oil until thoroughly coated. Place in the refrigerator to marinate, 1 hour or longer. After chicken is done marinating, preheat the oven to 350. In a large bowl, mix together the bread crumbs, seasonings, pepper flakes and Parmesan cheese. Thoroughly coat the chicken in the bread crumb mixture. Place chicken in a nonstick baking dish. This entry was posted in Kindle Bargains and Freebies and tagged Books, Fiction, Free, Kindle, Recipes, Writing by Lori Saltis. Bookmark the permalink.